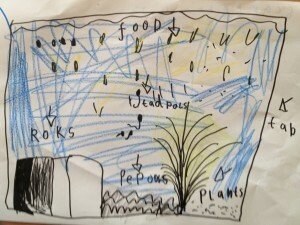 Notes from the Toybox: The case of the curiously coloured Tadpoles in Class. The case of the curiously coloured Tadpoles in Class. It's been nagging away at me for some time, and it's something that quite a few arty folk are also concerned about. Are schools trying to stifle artistic talent before it's even had a chance to bloom? There was a short sharp example of this at School this morning. One of Princess C's classmates is always drawing, and she draws some beautiful (and quite surreal) things. The class has a new Tadpole tank and the children were all busily drawing the tadpoles and the tank. We were talking to C's teacher and one little girl came up to proudly show off her drawing. The most beautiful rainbow-coloured tadpoles, all happily swimming around in a crayola-storm of cobalt blue, a work that I thought was utterly enchanting, amazing and brilliant. "Are Tadpoles that colour? Are they really? Did you look?" said the Teacher. The poor little girl looked utterly crushed or like she was about to burst into tears. I wanted to give her some encouragement and tell her that I thought her picture was awesome but there was that moment of nothing that passed between the teacher and I, that silent "I'm the boss here, don't disrupt the calm cool waters of my pond"
So creativity then? With the current strive to produce perfect little robot children who are literate and numerate, do we neglect to allow them the freedom of expression that drawing and creative play nurture? I don't get that. I don't get how there could ever be a way of thinking that literacy and numeracy are adequate substitutes for creativity when it comes to measuring success (particularly at school). So what if the tadpoles were multicoloured, to me it still looked like a busy and thronging tadpole tank with all the elements in the correct place - the colours were actually an added bonus not a detriment. I'm not sure what I'm trying to say from the top of my wobbly soapbox but I hate seeing instances where children are put down or dissuaded from creative moments because they're 'not doing things right' - Art was never about right or wrong, even when you get into the more technical aspects of exploring line and shape, colour and shade, anatomy and observation. Art was always about the amazing imaginative process of taking something that you have tucked away in your mind and letting it loose so others can share it.